"This award recognizes the volunteer efforts and financial impact our very unique one-day technology conference generates in terms of long-lasting results." What’s right with the region? Gateway to Innovation! 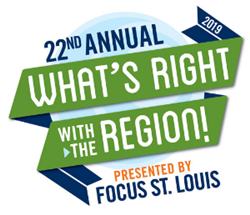 FOCUS St. Louis, the region’s premier leadership organization, has named Gateway to Innovation (G2I) one of 20 individuals, organizations, and initiatives that will be honored with a What’s Right with the Region award at a ceremony May 16, 2019. G2I was selected for an award in the “Promoting Stronger Communities” category. The complete list of honorees is available here. G2I is the region’s premier gathering of technology professionals and executives with a mission to return all conference proceeds to the community for improving technology education, IT careers, economic development, and non-profits with technology challenges. “We are grateful to FOCUS St. Louis for this wonderful recognition of G2I’s mission, which is uniquely focused on making our community stronger through technology in all possible ways,” said Eric Gorham, CIO at REJIS Commission and G2I Executive Committee member. G2I began in 2006 with a mission to strengthen the St. Louis region by returning 100 percent of conference net proceeds back to the community to support technology needs. The growth of the conference has made delivery on that mission significant. Through vendor, attendee and corporate support G2I has contributed $1,679,951 to more than 57 organizations, awarded 62 individual scholarships, endowed six scholarship funds, supported numerous STEM initiatives, provided funding to assist the start-up community, and offered grants to schools and non-profit organizations so they can make important technology purchases they could not otherwise afford. The 2019 Gateway to Innovation conference will be help April 25, 2019 at America’s Center Convention Complex in downtown St. Louis. Registration information is available on the G2I website here. About Gateway to Innovation: Gateway to Innovation is the premier annual collaboration and networking event for IT Professionals in the St. Louis region. Gateway to Innovation inspires innovation through premier educational opportunities led by the industry’s top leaders, provides an opportunity to share best practices and fosters collaboration with colleagues who face challenges and opportunities in our fast-paced industry. Since the first event in 2006, Gateway to Innovation has donated $1,679,951 for IT scholarships and for technology-related grants to St. Louis area educational and non-profit organizations. More information can be found at http://www.g2iconference.com or by contacting Kristin Tucker at 314-276-7600.